Education is a technology that tries to make up for what the human mind is innately bad at. Children don’t have to go to school to learn how to walk, talk, recognize objects, or remember the personalities of their friends, even though these tasks are much harder than reading, adding, or remembering dates in history. They do have to go to school to learn written language, arithmetic, and science, because those bodies of knowledge and skill were invented too recently for any species-wide knack for them to have evolved. I’ve visited a lot of schools over the past few years. All of them are working hard to do what’s best for their students, but too few, in my admittedly biased opinion, are getting reading right. 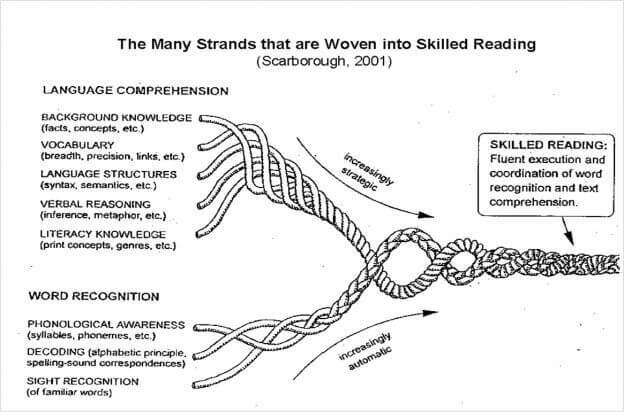 The mechanics of reading – phonological awareness, decoding, sight recognition – are mostly taught in Key Stage 1. The overwhelming majority of children best learn to read through systematic synthetic phonics (I am aware this is a can of worms.) but for all sorts of reasons a significant minority don’t. If you don’t ‘get it’ in KS1 your chances of getting it in KS2 are slim. If you’ve not cracked reading by the end of Year 6 you are, by and large, stuffed. Special Needs departments in secondary schools do what they can but in very many schools it’s too little too late. Every comprehensive secondary school will have some children who struggle to read. This is an endemic problem, with an estimated 20% of students leaving primary school unable to read fluently (i.e. at 300 words per minute). So, how do we tackle this tragic and completely predictable problem? In the main we assume these children have learning difficulties. We consign them to bottom sets. We get often unqualified staff to babysit them. And what happens? They leave school unable to read. The assumption that if student cannot read they must be stupid seems to stack up on the face of it – after all, they can’t do something we find effortless. And this is the problem: the ability to read is so effortless we tend to think of it as somehow natural. It’s easy to see how this happens. After all, the ability to learn spoken language is innate. We receive no formal instruction; we just pick up speech from our environments. Reading though is different. No one, no matter their ability, just learns to read. You have to be taught. You can read more about this here. (1) that the pattern of information-processing skills that underlie the reading deficits of low-IQ poor readers is different from the information-processing skills that underlie the reading deficits of high-IQ poor readers; (2) that the neuroanatomical differences that underlie the cognitive deficits of these two groups are different; (3) that low- and high-IQ poor readers require different treatments to remediate their reading problems; and (4) that there is differential etiology in the two groups based on different heritability of the component deficits. There is no such evidence. In fact, as he goes on to say, “there is a wealth of evidence regarding proposition #1 that is largely negative”. It might be that a reading problem is caused by low intelligence but it’s more likely to be a teaching problem. I have two anecdotes from my teaching career with support this finding. The first is the story of Sam. He was in a Year 9 bottom set class and when I first met him he introduced himself by saying, “My name’s Sam, I can’t read and I’m thick!” He was not a happy boy. His lived experience of school was one in which he went from lesson to lesson unable to do what everyone else found easy. The evidence of his stupidity confronted him daily and unsurprisingly he found school a torment. But Sam wasn’t thick. In conversation he was bright, lively, engaging and saw links and connections his peers were unable to see. Through a process of detective work we worked out that when he was in Year 1 he suffered from a condition called glue ear. This is a common childhood condition where the middle ear becomes filled with fluid and goes routinely undiagnosed. It’s estimated that one in five children around the age of two will be affected by glue ear at any given time, and about 8 in every 10 children will have had glue ear at least once by the time they’re 10 years old. Glue ear is hard to spot; it’s not that sufferers can’t hear, just that hearing becomes more difficult. Being able to hear the difference between vowel sounds is particularly tricky. And this might be effecting 80% of students! In most cases glue clears up by itself, and children may never realise they were suffering. But it may mean they’re unable to read fluently. In Sam’s case, no one noticed in had glue ear and instead his teachers assumed he was just slow. We were incredibly fortunate in the school I worked in to have funding to send Sam to get intensive one-to-one phonics instruction off site for six weeks. He returned six weeks later able to read. He was moved out of the bottom set and began to flourish. He left school with five good GCSEs and, a few years ago, he wrote to me to say he’d been accepted on a sports science degree course at Loughborough University. More recently, I taught a girl called Megan. Megan had Down Syndrome and as a result had very limited cognitive processing. But she could read. Whenever there was an opportunity to read aloud Megan’s hand would shoot up and she would read beautifully but often with no understanding of what she was reading. These experiences suggest that learning to decode has little to do with intelligence. Of course you have to be taught, but after that you either learn it or you don’t. If we think about the estimated numbers of children suffering with undiagnosed glue ear, it would make sense to conclude that for very many the problem is that they just can’t hear their phonics lessons. And poor hearing is just one of the myriad of reasons for a child struggling to access instruction. All this is complicated because difficulties in reading fluency are also tricky to spot. Computerised screening tests only tend to measure comprehension, but if a child’s ability to decode isn’t absolutely fluent, they may well be able to read a word and know its meaning in a test, but not in context. In order to see if someone has a fluency problem you have to listen to them read. If they skip words or substitute unfamiliar words with plausible sounding alternatives then they almost certainly have a problem with decoding. Unlike decoding, language comprehension is highly correlated with intelligence. But our ability to comprehend also depends on the speed at which we can decode. Normal reading speed is about 300 words per minute. If your reading speed falls much below 200 words per minute then the strain on working memory makes it much harder to understand the meaning of a passage of text. The mental resources a fluent reader can use to infer, hypothesise, speculate and anticipate are taken up with the laborious process of turning graphemes into phonemes. The more slowly you read, the more likely it is that comprehension will break down. Attempts to solve reading difficulties that assume the difficulty is caused by low intelligence are likely to result in frustration and failure. Our first port of call should be to assume that reading difficulties have been caused by ineffective teaching. None of this is to hurl the blame at hard-working infant teachers; even with the very best phonics instruction, if the children can’t hear you, they’re unlikely to learn. Instead we should be alert for signs of glue ear and, when it’s been treated, ready to offer the type of cure most likely to address the problem: intensive phonics instruction. Doing nothing – or doing what you’ve always done – is not an option. If it’s right that reading difficulties are, in the main, caused by teaching deficits not by intelligence deficits then it also makes sense to say that if a child leaves school unable to decode fluently it is the school’s fault. I couldn’t agree more, David. The sooner we have accountability for reading progress (decoding and comprehension) at secondary school the better. With effective instruction, this is such a solvable problem. And when it’s addressed it changes the life chances for students beyond belief. Surely we owe that to each and every one of them. Thanks Diane – I was inspired by your blog! So, how do you propose that we address this issue in secondary schools, when we teach 30 in a class, for 3 hours a week? I am in agreement with you, but there is no point people identifying issues, if they are not offering a solution. There are some wonderful TAs around but it always amazes me how those most in need of quality instruction are sent out of the classroom with the least qualified staff. Yes – this is hardly the fault of teaching assistants who do all they can, often with very little training. I think the point about glue ear could be supplemented (family experience) by undiagnosed problems with seeing. The most effective intervention in my daughter’s reading in year 1 was a visit to get her sight checked by a doctor (prompted by a routine medical check). She was prescribed glasses, which made a huge difference to her learning, and lost her 100% attendance record. The most effective intervention she has ever received is recorded only as a negative in her school record … . She had been intelligent enough to mask sight problems by intelligent guessing in reception in a way which was not scalable to more complex test, and had bad habits to unlearn, and poor spelling for several years. Alertness to very simple and correctable physical barriers to learning would make a difference. Is there a case for testing basic screening as an intervention for those falling behind? Thanks – yes, this would seem to be another sensible starting point. This is all pretty sound, but I think you over-estimate the frequency of undiagnosed glue ear. I can only speak for Norfolk–which in most respects has mediocre LA support for early literacy–but in well over a thousand pupils that we taught, there was never an incident of an undiagnosed hearing problem. Grommets were installed routinely, and there was some suspicion that it was used even when the problem was inadequate instruction. It was a bit like coloured overlays and tinted lenses– a convenient excuse that led to a hell of a lot of unsound diagnoses. These figures may be wrong but probably more reliable than your anecdotal experience. That said, I understand glue ear does seem to have a higher frequency in some areas than others and this is speculated to do with atmospheric conditions and other environmental effects. Maybe Norfolk is just lucky? Quick question, Tom, and if it’s a stupid one you can say so: “there was never an incident of an undiagnosed hearing problem…” If there WERE an incident of an undiagnosed hearing problem, wouldn’t it be… undiagnosed, and therefore unknown to you? Curious as to how a school managed to diagnose glue ear. It’s very difficult to get good visual/auditory assessments done, so how come it’s the school’s fault if it’s a sensory issue that’s causing the problem? We diagnosed it both on the balance of probability and by talking to the pupil’s mother about symptoms. The proof of the pudding was that he responded so well to phonics instruction when able to hear properly. If 80% of children are likely to get glue ear any school which fails to make this their starting hypothesis for reading difficulty is surely at fault. Excellent blog David. And I agree with it all right up to the last sentence. When a child can’t decode fluently it is almost always the result of a profound systematic failure. That is not to say that schools and teachers are not to blame, but that government LAs and teacher trainers are too. There is plenty of blame to go around. Honestly David, if a headteacher tries to shift responsibility for a student’s reading difficulties to universities, a local authority or the government I think they should be sacked. I suppose we agree there, except I wouldn’t *just* want the head sacked. I would want to sack the people who allowed it to get to that stage in the first place. Two things before I begin; 1.Do we still talk about “I.Q.” There are so many aspects to intelligence. 2.Is there any evidence that reading standards have improved since the universal teaching of systematic phonics has been employed – e.g. has England moved up the PISA scales or is there some comparative data ? In our education system we begin to teach reading at a much earlier age than in many other countries. In France it is six and I believe it is age seven in the Netherlands while we begin at four or even earlier. Premature and summer born boys can be developmentally eighteen months behind their peers when they start school. Add into that children from deprived backgrounds whose sleep provision, diet and attendance may be poor and you have children unable to focus and learn. falling behind at the starting gate is demoralising and there is your recipe for failure. Then there are visual and auditory problems, dyslexia etc. 2. Yes, but the phonics denialists don’t accept it so it’s probably not worth quibbling about. SSP is support by the most robust evidence of any teaching methodology. 3. You really need to read this https://www.learningspy.co.uk/literacy/reading-ability-nature-nurture/ to begin to understand why your arguments about environment are flawed. Please let us see this evidence. We have waited so long. And I don’t mean rhetoric from Prof this and Prof that. I mean figures, numbers, stats. No further comments on this subject will be accepted here. Shame. I am not messing as you seem to think I am. There is not yet any proper evidence for the efficacy of SSP. I agree wholeheartedly that if a child is not in a vegetative state, he / she can learn – and even then… ? Without going into masses of detail, if children who are not reading fluently at a level that enables them to access the rest of their school-life curriculum at end of year 2, could be given their own reading tutor / teacher, who will be there until the child can read, these difficulties would be solved. Better if this could happen before the end of year 2. So much of what happens in classrooms consists of stuff being delivered at children who may or may not learn it. The may not learn its may not show from day to day. We are doing stuff, we are filling our days. Everyone is working so hard. I would like to suggest, about reading, that out of 180 days in a year of early schooling, just a few unlearned lessons can make a catastrophic difference that would barely register in other subjects. Hats off! Thanks for engaging with the spirit of this. I always engage in the spirit of whatever I comment on. Primary schools can only suggest to parents that they take their child to the GP for further investigation. Whether parents act on that advice is another thing. I have asked a parent every week for the past term to take their child for a free eyesight test, as it is clear to me that the child has a sight problem, I have even threatened to report their lack of concern to social services all to no avail. If the figure quoted in the second article is correct then it is quite shocking that so many children diagnosed with dyslexia have had severe glue ear (and grommets fitted as a consequence). I would be interested if you have come across any further research on this connection. It may be that these children are being misdiagnosed as dyslexic when it is something far more specific? I’m no expert by the way, I have just recently developed a personal interest in the topic.